There are so many resources available online, how do you know which to choose? It is important to seek information about healthy eating and physical activity from credible resources. We recommend visiting the websites below. The Dairy Council of California is your source for planning meals, finding recipes and tips for feeding young children. Build your own cookbook with healthy recipes for your family using the USDA's What's Cooking tool. 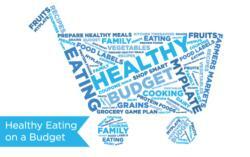 MyPlate can help you track your meals, and learn to save money while eating well.